On the afternoon of Thu 8 Jun following leaving work in a cloud of dust I started the first leg of my journey from Stafford to Blandford Forum. The weather was not promising and the heavens decided to open with no waterproof gear on at all. Following a short stop to gear up I then hit the road and arrived in darkness at everyone’s favourite second mums house, Sal and Tonkas. A warm welcome provided with a brew and a roast dinner was very much needed and appreciated. Winner winner, chicken dinner! A good nights sleep night later, Simon ( other prospect) arrived bright and early and we were ready for leg two to Dover. After a discussion about navigation, Simon “I don’t trust Sat Navs” decided to guide us to Dover. This was the first mistake. Eventually after I redirected us we found our way and boarded the ferry for Dunkirk and helped ourselves to some Fish and Chips. We departed the ferry and were greeted by some serious winds but no rain which made up for it. 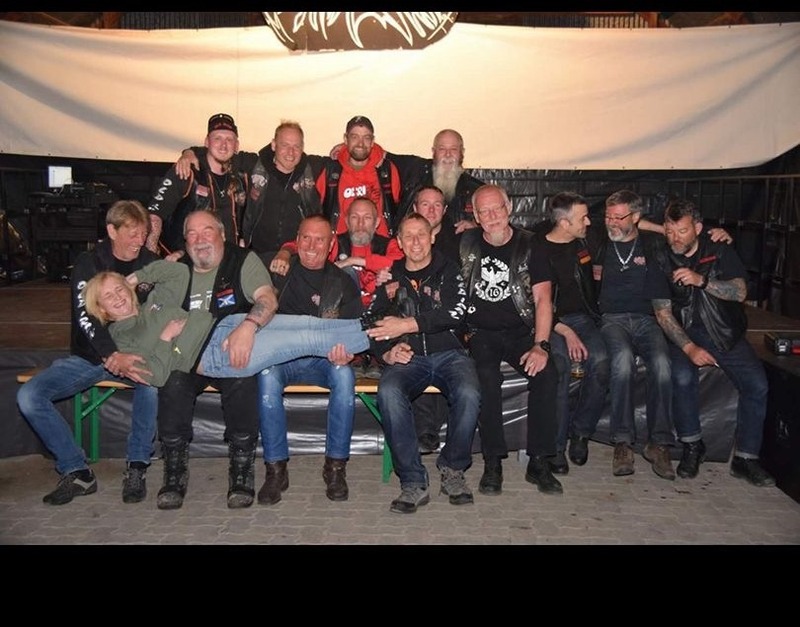 7.5hrs later after passing through France, Belgium and in to Germany following many fuel stops and after a couple more navigational issues we arrived at the Old Iron MC Rally in Frankfurt. On arrival at 2230hrs local we were asked what took us so long and told the party was over (I begged to differ). Tents up, Simon and I were dragged in to the bar by the Heathens and made to catch up by racing each other which enabled the party to re-start. The night continued with the usual tomfoolery and ended with me putting Jim and Simon to bed (separately) and saving Gregor from doing a Moz and falling in to the fire. The second day consisted of hair of the dog in a local pub with some pizza and then an ice cream on the way back to the site. The weather was amazing and there was absolutely nowhere to cool down. As the day continued it was clear to me that the Europeans go big on a Saturday as the party grew in to the night with entertainment involving fire, some good music and what can only be described as some Eurovision music. The night came to a close reasonably early for most (not Jim) due to the early start to our respective ferries in the morning. Sunday consisted of setting off early doors where we stopped near Cologne for a fuel stop. I said my goodbyes and set off on my own merry way back to Dunkirk with the remainder heading to Amsterdam. Arriving 3.5hrs before my ferry I managed to jump on an earlier one and even cleared a good area for myself to have a kip (probably due to the smell). On the far side I was made to feel welcome at Dave and Hollies for the night and a much needed shower before heading home on the Monday. All in all a very enjoyable, if short first trip to the continent. Roll on the club 40th anniversary!